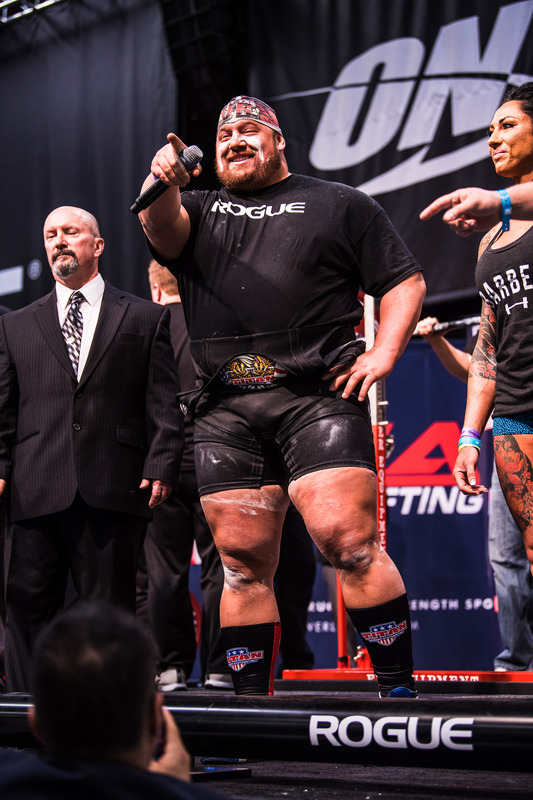 Blaine Sumner is an IPF Powerlifting World Champion and currently holds the most Open World Records in Powerlifting. He got his start in athletics at an early age growing up in Conifer, Colorado and playing 4 sports (Football, Wrestling, Lacrosse, Track) through high school and earning All-State or All-Conference accolades in every sport. Blaine then attended college at the Colorado School of Mines where he earned his Bachelor’s of Science in Petroleum Engineering while starting 4 seasons on the Oredigger’s football squad. After an All-American career at nose tackle, he drew a lot of attention from NFL scouts and participated in multiple Pro Day events where he set the NFL testing records for the Bench Press (225 lbs X 52 reps) and the Kirwan Explosive Index (formula consisting of bench press, vertical jump, and broad jump). Coming out of the 2010 NFL lockout, Blaine never had the chance to prove himself on the NFL level and began to pursue his career as a Petroleum Engineer and dedicate himself to powerlifting. Since turning to powerlifting as his full time physical pursuit, Blaine has set the lifting world on fire. Regarded as the greatest raw & single ply lifter in powerlifting history, the record books are decorated with his name. Blaine’s best numbers in competition are his 1,113 pound squat, 915 pound bench press, 816 pound deadlift, and 2,805 pound total. The squat, bench press, and total are all World Records. Blaine has also recorded a 692 Wilks Score (body weight pound-for-pound comparison) which is the highest ever recorded in powerlifting. However, that is not where his story begins – it was a long road to the top. As a freshman in high school, he weighed 140 pounds at 6’ 1” and was one of the weakest kids on a small high school football team and didn’t bench press 135 pounds until he was 16 years old. Dedicating himself to becoming a bigger and better athlete, he graduated at 260 pounds at 6’ 2” while playing linebacker. He continued to naturally bulk up through his college football career at a playing weight of 335 pounds at 6’ 3”. Through his powerlifting career he has continued to pack on the muscle and strength and now weighs 375 pounds. Every single pound of muscle and pound on his squat has been achieved through a drug-free lifestyle and he has remained a drug-free athlete his entire life.